As the weather warms up, it's tempting to grab the family and the dogs and head out for a hike. But if you live in a few key areas, you might be putting yourself at risk of a scary disease. According to CBS News, ticks in the Northeast and the Great Lakes area have been found to be carrying the Powassan virus. It's a rare condition that produces symptoms similar to Lyme disease, but more severe, and there's no cure. The disease can lead to encephalitis and meningitis, and give you permanent neurological issues afterward. 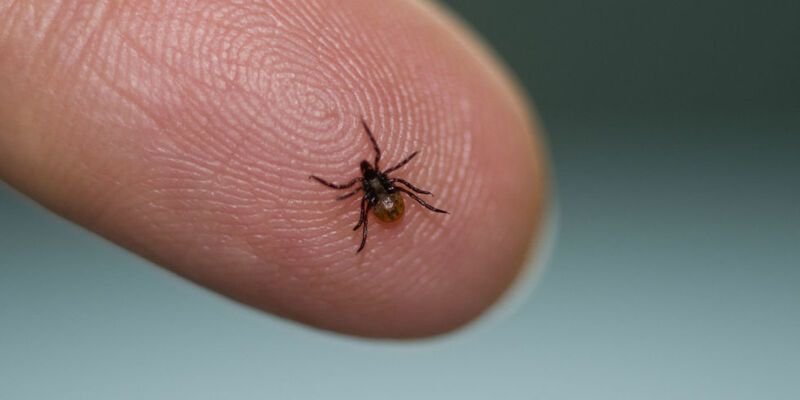 And it can act much more quickly than Lyme disease, giving you symptoms within hours of being bitten by a tick, according to Fox News. About 10% of cases that lead to encephalitis are fatal. Powassan is extremely rare, having affected only 50 people in the U.S. over the past decade. In contrast, 30,000 cases of Lyme disease are reported to the CDC each year (though the number of people diagnosed with Lyme disease each year in the United States is estimated to be around 300,000). People who work outdoors or go camping in affected areas are at a higher risk of infection. If you want to protect yourself, government officials say you should avoid wooded and bushy areas with high grass, use bug spray and conduct a full-body tick check on yourself, your children and your pets after going outdoors.